I could have tried to repair the damage by grafting but I was very busy that spring and never got to it. I decided to just write it off. The next spring, a few shoots sprang up from what was left of the roots. Most of the shoots were from the root-stock, the part of the tree on to which the Lord’s Seedling was grafted on to at the nursery. Those shoots would never produce a Lord’s Seedling apple because they have a different genetic background. Russeting is considered a defect in the commercial apple world. 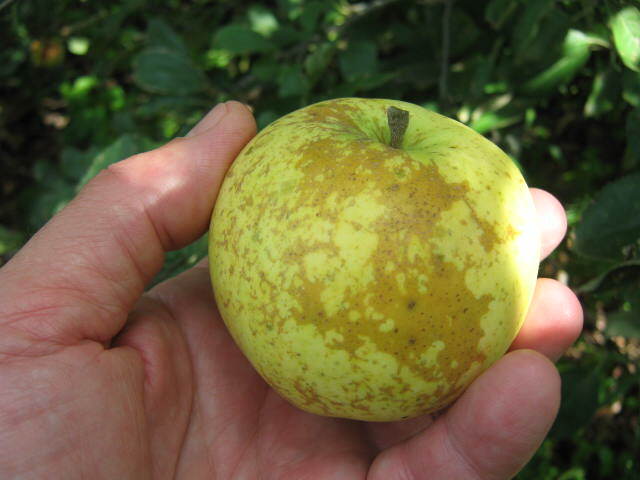 On Lord’s Seedling apple the gorgeous golden-brown russet is a part of it’s normal appearance. This year, the tree grew a full crop of apples and I was finally able to see what variety it really is. Low and behold, turns out it is a Lord’s Seedling tree after all. I took an educated gamble on the tree and it took until now to finally pay off.